Aloha, beautiful people of the Inter-webs! Today, I give you a quick list of ways to spice up the traditional ponytail. A ponytail can get really boring after wearing it for what seems like the millionth time. I, personally, wear a ponytail to school everyday, so with that said, you need to add a pop of something new every once in a while so it doesn’t get boring. This is a quick and easy 4 step hairstyle. All you have to do is: 1) bring your hair into a ponytail. 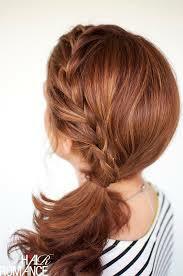 2) Braid a 1″ piece of hair from the ponytail. 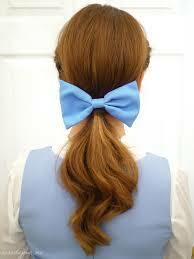 3) Wrap it around the base of the ponytail where the elastic band is. 4) Bobby pin the braid in place after wrapping it around. Voila! There you go. This is just a simple way to add volume to your hair. All you have to do is tease the base of your head before pulling your hair into the ponytail. It will also help if you spray some sea salt spray to your hair before teasing to add extra volume to the volume you already have. This doesn’t really have to do with the ponytail, so you can wear it with a bun too. All you have to do is take a 2″- 3″ section of hair from under your ear from one side of your head and braid it. When you are done braiding it, grab it and pull it to the other side of your head to make a braided headband. This is quite simple if you know how to French braid. You will just start French braiding your hair from the front till you reach the middle of the back of your head. 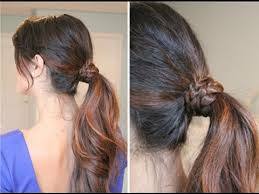 After that you will grab the rest of the hair that was not braided and pull it in with the braid to create a ponytail. This will give you an edgy yet delicate look to the plain old ponytail. Such good ideas to spice up the normal pony! My favorite is the braid around the elastic.